Cheong hei (long-winded) travel post as usual. Lots of $aver tips below! I didn’t go on a vacation last year. So, this year I make sure to get at least one out of it. I have three choices when it comes to my next holiday destination. Hong Kong was one of it. I was almost in a position of doing my first ever solo backpacking trip, so I choose Hong Kong since I’ve been there twice before, and I think it’s kinda okay for solo woman traveller. But then I got myself a travel partner – my sis! So this became our 4th overseas siblings-only vacation. My previous Hong Kong trip was 7 years ago (2011) and since then I have been looking forward to my next trip so that I can stuff myself silly with more yummy food. So, for this 5 days and 4 nights (22nd April to 26th April 2018) trip, it’s all about FOOD, FOOD, FOOD! Funnily, it wasn’t food that blows me away, but new experiences. After this latest trip, my love for Hong Kong declined a lot!!! Wanna know why? Then you gotta follow my 2018 Hong Kong travelogue. 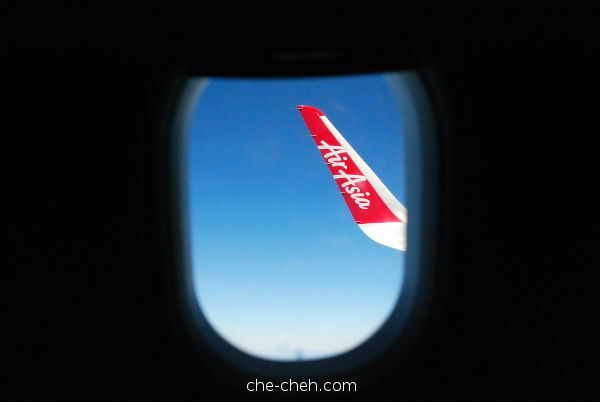 In order to travel budget, we choose AirAsia. I’m still not fond of the super loooooong walk to the boarding gate. On the positive side, it’s good exercise! Two and half years ago, I mentioned in my Taiwan post that there is only one water dispenser throughout the length of the departure hall (at P10) of KLIA2. This time, they have installed one more at P3. Now, this is better. Our flight departed 10 minutes early from KLIA2 and arrived at Hong Kong International Airport (HKIA) 25 minutes ahead of schedule!!! Talk about more good luck, our luggage was basically the first one to appear. As soon as we walked out of the arrival hall at Terminal 2, we turned left and head to the end of the building to get some important stuff to ease our travel. I showed a printout voucher to the lady behind the counter and she swiftly passed me the SIM card. It was real fast. Like in less than 5 seconds. She told me the SIM card is already activated and I can use it right away without any setup. True enough, I was connected to the online world right away. Funnily, I always get 4G data (shown on my phone’s screen). Wohoo! Connectivity wise, the signal was good throughout my time in Hong Kong. I highly recommend getting from them. Next, we went next door to the MTR counter to buy on-loan Octopus card. Although Klook offers Hong Kong Tourist Octopus card for HK$94 (MTR website version is called Sold Tourist Octopus), I didn’t get this tourist card version. Because of the HK$94, HK$50 is the initial stored value. Means the remaining HK$44 will just be burnt. This is because you don’t have to return the Tourist Octopus card, it’s a souvenir to take home. If however, you wish to get a refund from the remaining stored value of the card, then you must return the card. For on-loan Octopus card, it costs HK$150, of it HK$50 is the deposit (refundable) and HK$100 is the initial stored value. When you return your card at the end of your trip, HK$9 will be charged for admin fee plus any remaining stored value will be refunded. 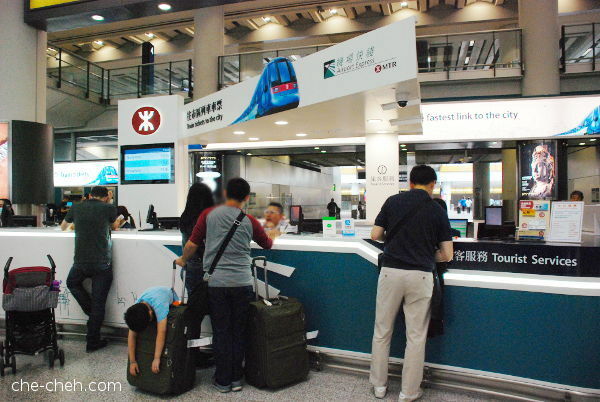 Tip: You can top-up your Octopus card at the machines found at MTR stations, the minimum value is HK$50. Then we proceed to Airport Station for Airport Express train ride to Kowloon Station. I contemplated taking the airport bus (which is way cheaper, will take us to the nearest MTR but need to walk over 10 mins) however the idea of paying extra for convenience sake after a tiresome journey is much welcome. Again, I bought our Airport Express round trip train tickets to/from Kowloon Station prior to our trip from Klook via Shopback (referral link) for only HK$117 (usual price is HK$185). That’s a big saving there! And if you want to know another saver: upon check out at Klook, enter promo code EXTRAFUN18 to enjoy HK$15 off on any purchase over HK$150 on selected travel products (valid until 31 December 2018). More info here. I use this promo code while purchasing the SIM card and Airport Express train tickets together. Love the savings! To pass the Airport Express gate at the Airport Station, all I need to do is scan the QR code of our ticket voucher on my handphone. Easy peasy. 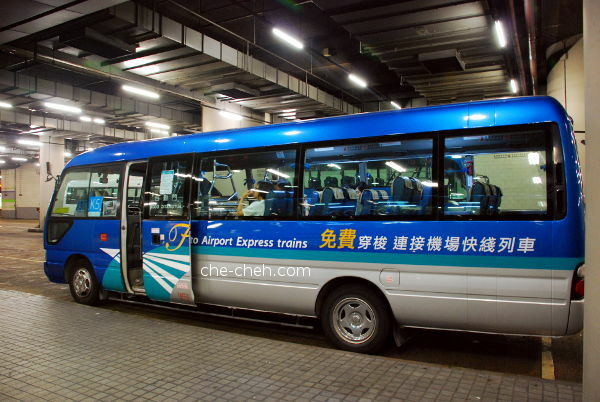 And do you know that there are complimentary Airport Express shuttle bus service that runs between Hong Kong Station or Kowloon Station and major hotels and MTR Stations? Coincidentally our lodging is very near to one of the stops (like 3 minutes walk only!) which tells me choosing Airport Express is the wisest choice. 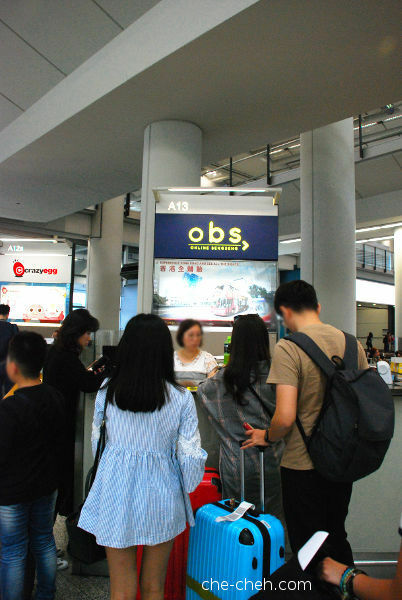 Although passengers need to show proof (in our case is the Airport Express ticket voucher) upon boarding, we were never asked for it during our round trip. Traveling on Airport Express was very smooth. It was our second time on it. 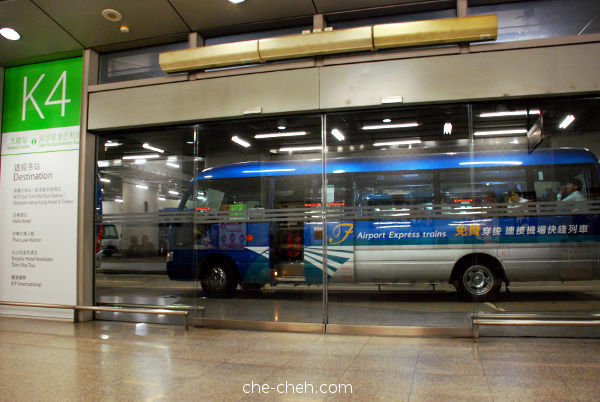 Upon arriving at Kowloon Station, there are clear signs that point us to the complimentary shuttle bus location. Waiting for our complimentary Airport Express shuttle bus at Kowloon Station. Tsk, there is toilet at the waiting area. 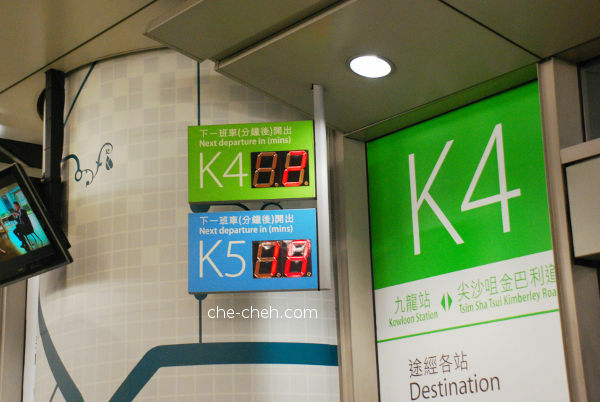 Countdown to the next Airport Express shuttle bus at Kowloon Station so you know how long you need to wait. Our ride to our lodging place. By the time we reached our lodging, it was 3pm (2.5 hours later upon touchdown). And our lodging was in a real Hong Kong home booked via Airbnb. I’ve been meaning to try out Airbnb for a few years now, and usually, it’s either not suitable with my travel groups, too expensive or like in my previous Japan trip where Airbnb was in a grey area at that time so I didn’t dare to take my chances. I’m glad to find a place that is affordable, and more than that we live together with the host and her family in a really small flat. I was really surprised at how small the flat is and our room too. Since it’s a private home, I’ll show 1 photo only. This is our room. That’s the only walking space (more behind me) in our room with a very comfortable double bed beside it. Just a little further behind is a square table where we put our luggage. The room has a window and a very old-styled air-cond. Their kitchen is also very small and clean. The bathroom is unexpectedly spacey and very clean. Living hall and dining area are small and cute. Like Malaysia, we leave our shoes outside. As for drinking water, they buy from outside except for hot water which they have a thermo pot. I wonder why? Overall, it was a very good experience. Not bad at all but just lack a tiny bit of freedom. Once we settled in, we took a short nap. We went out at 4pm, got lost a bit (first time mah) and finally found our way to Mong Kok MTR. When we were lost, we stumbled upon a market (at Cheung Wong Road & Canton Road). We had dinner at Mak Man Kee Noodle Shop (check out my review). I was really hungry by then. After dinner, we walked to Lee Keung Kee North Point Egg Waffles for what else? Egg waffle aka eggette! Click the link for review. After buying our snack, we stumbled upon Best Mart 360° (優品 360°). They sell snacks from oversea at bargain prices! Too bad we only have a look-see for few seconds as we need to hurry. Next, we ride to Tsim Sha Tsui MTR and walked to Public Pier no. 3. What’s there? 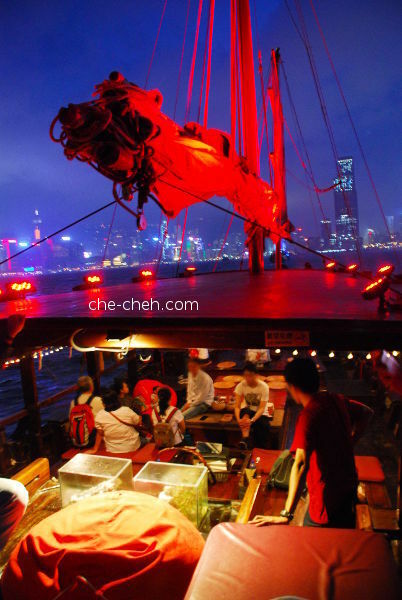 It’s the meeting point of our Duk Ling Victoria Harbour cruise!!! 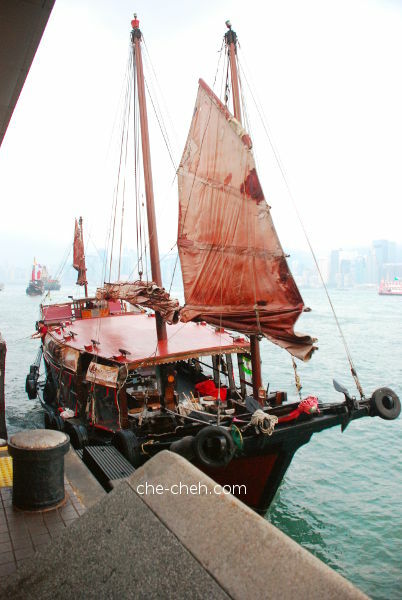 Duk Ling is the name of a junk (sailing ship). 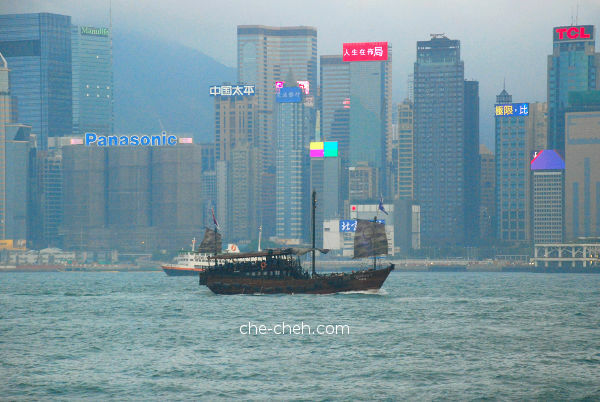 It’s the last remaining authentic junk ship in Victoria Harbour, Hong Kong. There are other junk ships that offer cruises too but they were built from scratch as junks replicas with modernization for tourism purpose. 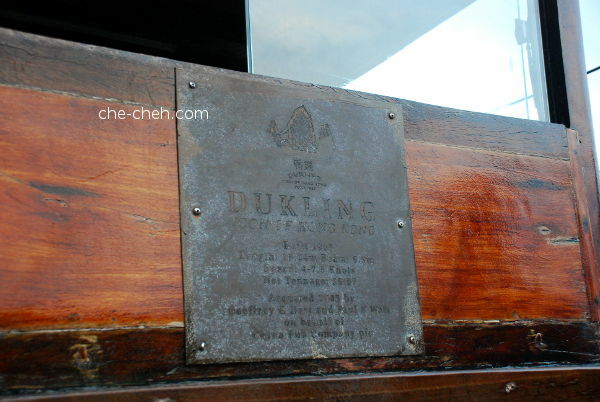 Right before my first ever visit to Hong Kong in 2007, I found out about Duk Ling and had wanted to ride on it. 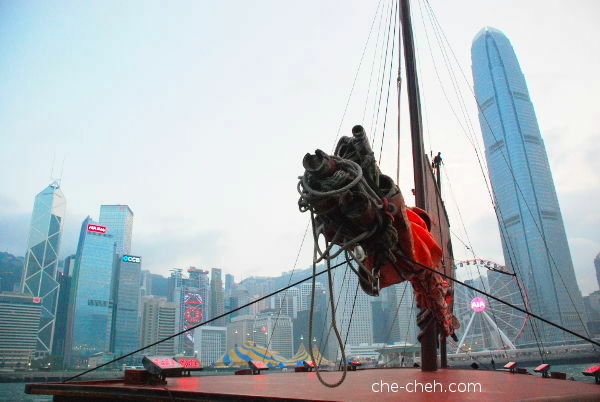 I’ve seen junk ship in history books and the chance to sail on it across Victoria Harbour would be a really fab experience. At that time it was chartered by Hong Kong Tourism Board with only sparse tour dates, limited tourist admission and inconvenient registration (need to register in HK). So I gave up. During my 2011 trip, I didn’t follow through because my mom is not fond of water. So this time, I check out Duk Ling again and found that it’s now operated by Duk Ling Limited (since 2015). What’s more? We can now buy the tickets online at their website. So yes, the rest is history! Tsk, KKDay.com is selling the ticket at a cheaper price though by not much. I booked at Duk Ling website and choose the 6.30pm tour at HK$230. It’s the perfect time for day and night view. 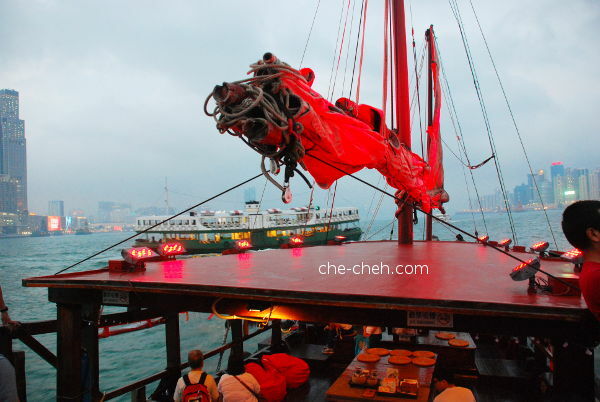 If you’re going for the Symphony Of Light tour, the cruise will be an extra HK$50… HK$280. Only 30 tickets are on sale in each session. You can also buy your ticket at Public Pier no. 3 or Central side (pier no. 9) if there is still space available. View of Victoria Harbour while waiting for Duk Ling. The junk in the photo is one of the replicas. 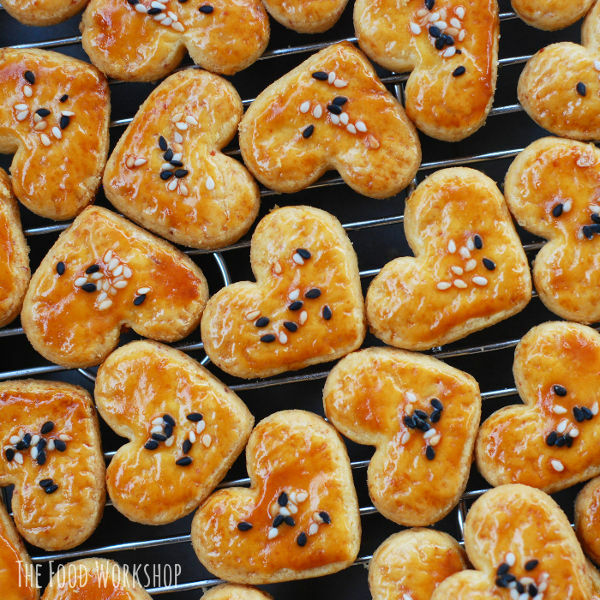 Oh the sweet Duk Ling! Duk Ling was born in 1955 at Macau and was originally a fishing boat. She’s 63 years old this year. Read more about its history at its official website, wiki and Paul E Watt’s Linked In. The crew helped us into the ship and before long we set sail! Only the front and back sails were up throughout our ride. I wish to see all the sails up. Do you know what the masts (poles) are made off? Bamboo! No one sat at the sheltered area although it looks very pretty. 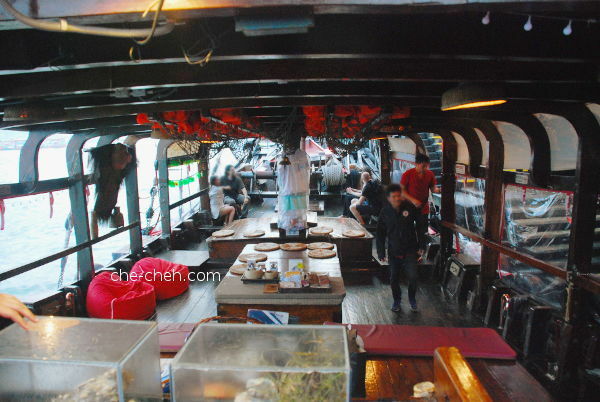 We all scrambled climbed to the back (quarterdeck) of the ship and sat in the open area. In the left foreground of the photo above, do you see two square glass boxes? They housed a bell and another item which I’ve no idea what it is. These two items were used in Duk Ling before it sank in 2014 due to a typhoon. The plaque is located in front of the wheelhouse. 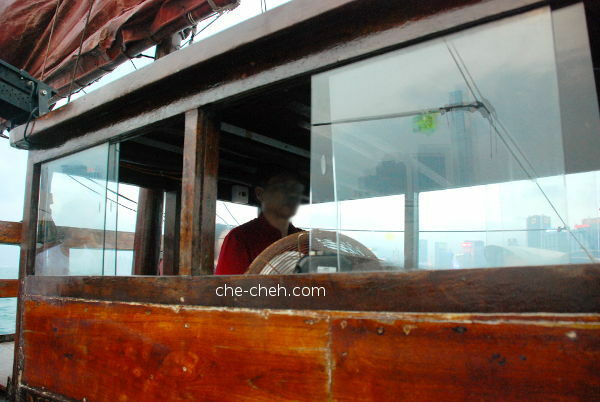 We sat right beside the wheelhouse and got to watch the helmsman in action of steering the ship. However we also smell the diesel engine depending on the wind direction. The ride was pretty bouncy and very windy. Awesome view towards Hong Kong Island. We’re heading there to pick up more people at pier no.9. Some got to sit at the quarterdeck with us, while some at the sheltered area. The price of the ticket includes one complimentary drink (wine/beer/carbonated drink). It’s a 45 mins sail around Victoria Harbour. Including our stop at Hong Kong Island, it’s nearly a full 1 hour. There’s also a tour guide explaining the history of Duk Ling. We didn’t listen much as it was noisy (engine, waves, wind). The moon, Duk Ling and Two International Finance Centre. The moon and Duk Ling. When night falls, the lights are on. So pretty! Colorful lights from skyscrapers makes Duk Ling more stunning. Overall the trip was interesting and fun. 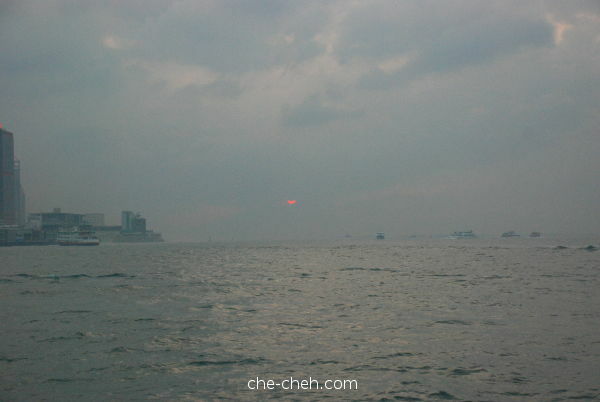 The fun part was when we were sailing towards and along Hong Kong Island, with the wind blowing our face. It was a bit boring on the way back to Kowloon as the wind stop blowing and it feels a bit warm PLUS not much lightings on this side of harbour. When we were near our disembarking spot (back at pier no. 3), only I realized I forgot to visit their loo. There are two washrooms under the main deck (I emailed them haha). Actually, I wanted to visit the loo just for see-see and also view the architecture under the deck. Gah!!! I guess I would have to take another ride in the future. When we disembarked, we stopped for refreshment and buy breakfast for tomorrow at Hui Lau Shan (for sis) and 7-11 (for me). We got a shock at the prices at Hui Lau Shan. Then back to lodging. It was a pretty warm and humid night. That’s all for day 1. More coming! Some good tips to save $$$! Thanks! Why did this trip make you dislike HK? Cant wait to read about it! I wish I can ride on Duk Ling! So there is only one junk ship? Or more than one? Only one authentic junk ship. The rest (like Aqualuna; I think there are one or two more) are built from scratch for the purpose of tourism not too long ago. 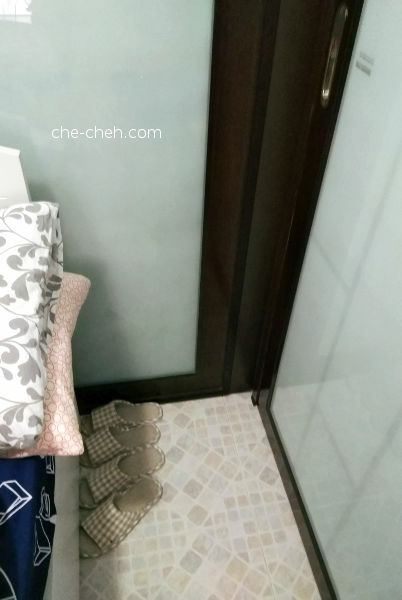 Why did you get a shock at Hui Lau Shan prices? They increased the price?? Yup. Over HK$40 for juice drinks. Price vs quality = not worth it. Hi Tekkaus, one tip is choose listing with good reviews. Hehe thank you in advance first. Yup, not cheap. It’s getting more expensive compared to last time. Hi Dawn, ohh wow. Enjoy yoooo!